Notices For Upcoming Fly-in Events Planned On The VATSIM Network. 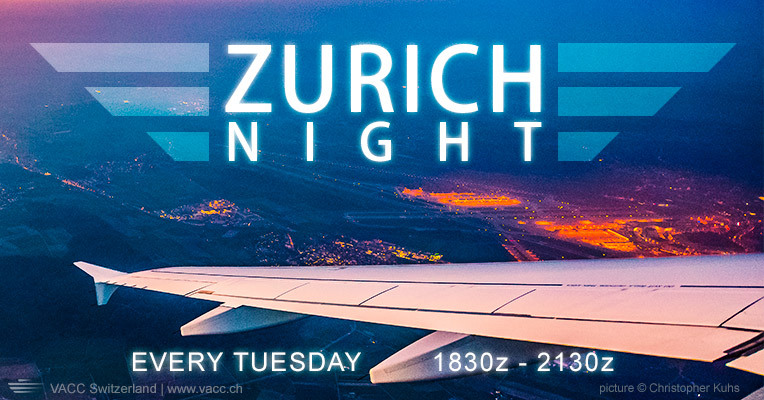 Welcome to the Zurich Night, the weekly onlineday of Switzerlands major airport! Every Tuesday from 1830z to 2130z, expect full staffing, professional and friendly ATC service and plenty of traffic. Enjoy one of total 4 IFR approaches or get yourself a spot as a small VFR aircraft between the big birds. VFR flights are still performed regularly despite the airport's size. This makes flying VFR to/from Zurich extremely interesting, but it's also a huge challenge which requires careful preparation. A lot of small airfields in the vicinity offer numerous possibilities for short VFR hops. Zurich is a unique airport with a lot of operational restrictions due to noise abatement and its challenging layout. We know it by heart and love this airport with all its rough edges. And we are sure you gonna love it as well! Join our frequencies every Tuesday evening and enjoy! Find valid routings on routes.vacc.ch. Still looking for a destination? We recommend Berlin Tegel (EDDT) and the Adria Region. Our colleagues there are online between 19z and 22z.